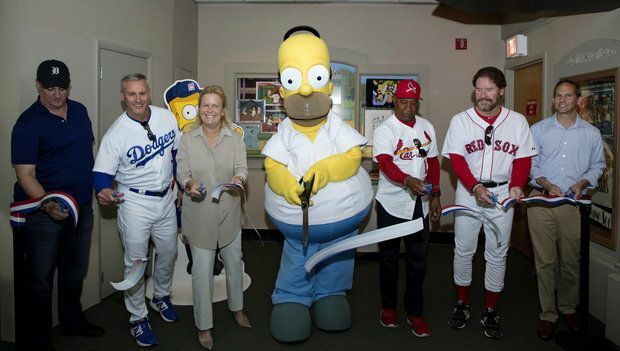 Homer Simpson was inducted into Baseball’s Hall of Fame as part of a The Simpson’s exhibit commemorating the 25th anniversary of “Homer at the Bat.” For baseball that was good news, because someone cares about the game that lost its way in the culture. Memorial Day and Baseball were important once. It was a day marked with remembrance at the ballpark and a doubleheader. That was when baseball was the king of sports in the United States with boxing and horse racing trailing in second and third place. Baseball didn’t share many summer days with other sports. There was the Indianapolis 500 which once was a premiere May 30 sporting event, maybe the Belmont Stakes in June or a tennis championship or a golf major and the Olympics every four years and that would not necessary be in the summer. There are no songs written about baseball players anymore. Take Me Out to the Ballgame was composed in 1908, no poems like Casey at the Bat, no double play combination has been immortalized in a century like Tinker to Evers to Chance. There are no Broadway plays anymore like Damn Yankees or television programs where Leo Durocher might show up to scout Herman Munster. The last major baseball movie was Moneyball in 2010. Major League, Bull Durham, Field of Dreams, A League of Their Own and the Natural are a generation old as is Ken Burns’ baseball documentary. Comics did baseball routines and the most famous routine remains Abbott and Costello’s Who’s on First. Bugs Bunny took on the Gashouse Gorillas. The great DiMaggio is mentioned in Hemingway’s Old Man and the Sea and Joltin’ Joe also appears in Simon and Garfunkel’s Mrs. Robinson tune. Homer At The Bat is 25 years old but Homer Simpson is a Hall of Famer. The Simpsons show is still around but is as not relevant anymore. Sort of like baseball.